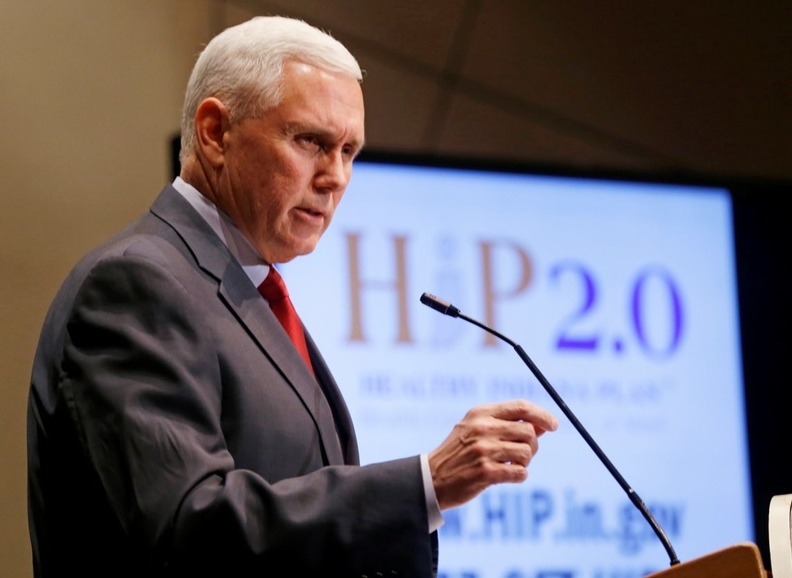 Vice President Mike Pence secured a CMS waiver allowing Indiana to require cost-sharing in its expanded Medicaid program. Indiana officials are not directly responding to claims that they cooked the books when assessing the performance of the state's Medicaid expansion plan. They instead say measures that require beneficiaries to help pay for premiums and contribute to health savings accounts are helping people become more personally responsible while providing them coverage. Indiana's Medicaid expansion program, known as Healthy Indiana Plan 2.0 is on track to end Jan. 31, 2018. The state has requested a three-year renewal. NPR last week reported that the state's application had misleading and inaccurate information to justify extending HIP 2.0. Staffers at the left-leaning National Health Law Program and Center on Budget and Policy Priorities reviewed the data and found it flawed. The Indiana plan has been a model for other red states such as Kentucky and Ohio which are looking to gain the federal funding for expansion but aren't necessarily onboard with the Affordable Care Act-led initiative. Indiana's program was co-designed by Vice President Mike Pence when he was governor of Indiana and Seema Verma, President Donald Trump's pick to lead the CMS. Under Healthy Indiana 2.0 plan, beneficiaries pay premium contributions, have health savings accounts, get incentives for healthy behaviors, and face a benefit lock-out if they don't pay premiums. As many as 350,000 people are believed to have gained access through the program. On Tuesday Jim Gavin, a spokesman for the state's Medicaid agency did not comment on the false data claims but defended the model. He said the state had made significant progress on reducing the number of uninsured, promoting value-based care and personal health responsibility, and disease prevention. “No one disputes that Indiana's Medicaid expansion has helped provide vital coverage for several hundred thousand low-income Hoosiers,” said David Machledt, senior policy analyst with the National Health Law Program. The question is whether HIP 2.0 is more successful than a straightforward Medicaid expansion without premiums or health expense accounts. “On that question, we have seen no evidence that Indiana is performing better for low-income enrollees,” he said. Data in the pending waiver request were based on findings by the Lewin Group, an independent consultancy which Indiana hired to evaluate the model — something that is required by all states that request a 1115 waiver to tweak their Medicaid programs. A spokesman for the company said it stands by its work and methodology. The allegations have generated dozens of comments on the federal Medicaid website asking the CMS to either demand the state drop its more conservative measures or undergo a new independent evaluation of the model. The state rejected the Obama administration's request for data and patient records to perform its own evaluation of HIP 2.0. Then-Gov. Pence said there was no need for the CMS to perform its own evaluation. His administration said the CMS was biased in a draft survey that included leading questions. The Obama administration likely would not renew the waiver but given that Pence and Verma are in influential positions in the Trump administration, they may dismiss the new accusations of flawed data or view the allegations as a partisan attack. The CMS is taking comments on Indiana's waiver renewal request through March 17. An agency spokesman did not immediately return a request for comment.